The 'Goray' Going Crazy over Mehndi by Painting it on their Bodies Reminds Us of How "Weird" it Once was! The ‘Goray’ Going Crazy over Mehndi by Painting it on their Bodies Reminds Us of How “Weird” it Once was! Every desi girl has had the experience of hearing, “what is that smelly thing on your hand?” when she was young. The male cousins at the Eid-Milan parties would often run away from you if you were wearing mehndi on your hands. Sometimes because of the smell and sometimes because of how ‘creepy’ it looked, you have been through the stares and “stay away from me” more than once in your life. 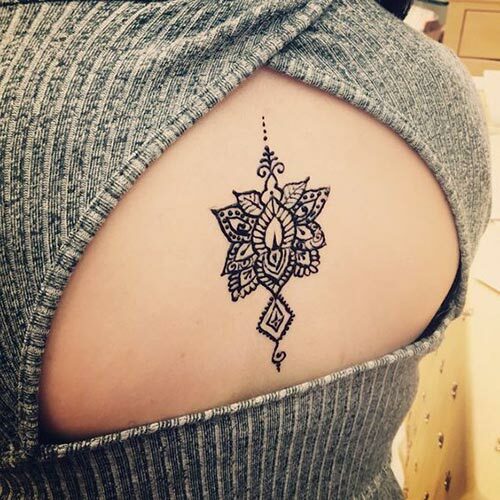 A few years ago, Henna/Mehndi tattoos became a thing. The Westerners were enjoying the temporary tattoos on their hands and arms. It became sort of a trend for a while and everybody was trying it. The tattoos, however, we nothing like the original mehndi – except for the color. While it is common to see the West inspired by the trends happening in the East (knock knock, remember ajrak bikini by Forever 21?) they make it a bit wee creepy every time. Now this Time, they are Applying Henna All Over Their Bodies! And they are actually loving it. Who Applies Mehndi on their Backs…? Oh and This Isn’t Weird…to Apply Mehndi on your…Chest…? Wonder if they are okay with the smell which creeped out so many people when desis used to do it. Cultural appropriation done in the West sometimes makes us brown people laugh, tbh. But we gotta give them the points for trying and slayin’ in them so impressively. These are perhaps one of the weirdest places to apply mehndi at. I am sure if a brown girl does it, she would be considered as a “weirdo” or would be told to leave because of the smell.